A sport with over two centuries of history takes a dive into the world of esports through the CVR World Cup. This article is brought to you by Cycligent. Frank Garcia, a former cycling competitor, said that he was heartbroken when he had to cut back on riding his bicycle in races and recreationally because of work. That’s when he discovered Zwift, a massive, multiplayer online cycling game that allowed him to hook up his racing bicycle to a trainer—essentially what makes a bicycle into a stationary bike seen at a gym—and ride around in a virtual world from his home. While keeping a passion that drove him to climb (virtual) Mount Everest in 2015, he found more time to spend with his family, especially with his son, Frank Jr.
One day, his son bought a Dota 2 skin to support its esports competitors and, like some parents, Garcia had no idea what to make of it. Sparked by his son’s love for esports and his love for cycling, Garcia founded Cycligent Virtual Rankings, a system that ranks competitive Zwift riders based on how well they ride in races, and the CVR World Cup, a competitive virtual cycling league, in 2017. Technically, the CVR World Cup is considered an esport. 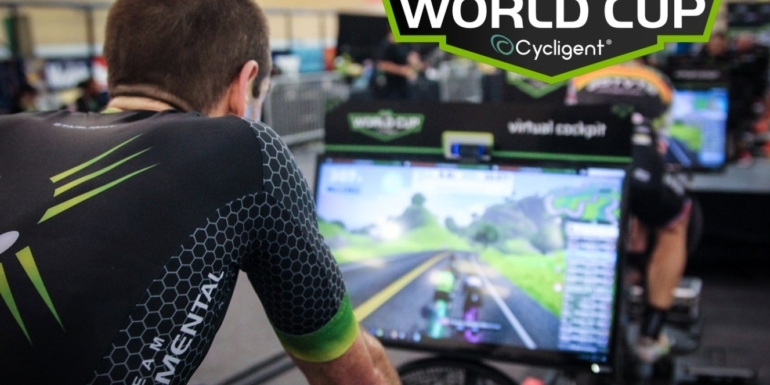 All the action takes place inside the virtual world of Zwift, but there’s a physical aspect to the game—actual cycling—that Garcia said the league’s athletes love. Not many video games that are played competitively today offer a full-body physical component to its controls, with the more notable exceptions being dance simulators, such as Just Dance and Dance Dance Revolution. Because of this unique blend between esports and sports, Garcia believes that his league could reach fans from older cycling enthusiasts to kids with parents who want them to get active while also enjoying video games. This esport’s accessibility, he said, could make this a contender someday for a spot in the Olympics, which has held cycling races since the first modern summer games in 1896. Men and women from around the world compete in the CVR World Cup through virtual races held in eight regional zones over three seasons per year. If a racer performs well enough during a season, they could earn free gear and ultimately rank up into its “A” Racing Bracket, the league’s highest tier of competition. Those who reach the top of the league’s most elite bracket and win their zone’s postseason tournament, plus a few wildcard second place racers, get to compete in a CVR World Cup Live Event at the end of that season, where they have the chance to win cash prizes and the title of CVR World Cup Global Champion. This weekend at the Harry Jerome Sports Centre in Vancouver, the CVR’s top cyclists will compete in the CVR World Cup Vancouver Major, which marks the end of the league’s Spring Season. The event starts on Saturday, June 23 at 9:45am PT and Sunday, June 24 at 8:45am PT (the full schedule is available here). It’ll be broadcast live over cycleVIEW.tv, CVR’s proprietary streaming platform, as well as CVR’s Mixer channel. Racers will compete in five stages in men’s and women divisions over two days, accruing points by finishing races and leading them at certain sections. The top cyclist who earns the most points at the end of five stages wins the event, and will receive $10,000. For comparison, the sport’s real life counterpart gives the same amount to the eighth-place finisher at the Tour de France. Competitors at the event come from all walks of life. One is 22-year-old Esther Meisels, who competes in physical races around America and placed fourth at the CVR World Cup Los Angeles Major. Another is Sadeo Ikebe, a 40-year-old Japanese cyclist who competed in his first CVR Live Event race at that same Los Angeles Major. Besides the upcoming CVR World Cup Vancouver Major, Garcia said that his league will soon expand to hosting teams rather than individual racers. Although its launch date is yet to be announced, the CVR World Cup Team Tour is expected to give out over $20,000 to male, female, and mixed gender teams who complete and stream every race in a given season. Ultimately, Garcia’s goal with the CVR is to get more people interested in what he—and many of the CVR’s racers—love.